We are no longer taking registrations for the Spring Session. Spring Classes will be held March 25-June 2. SPRING 2019 JCP Begins on March 25, 2019. 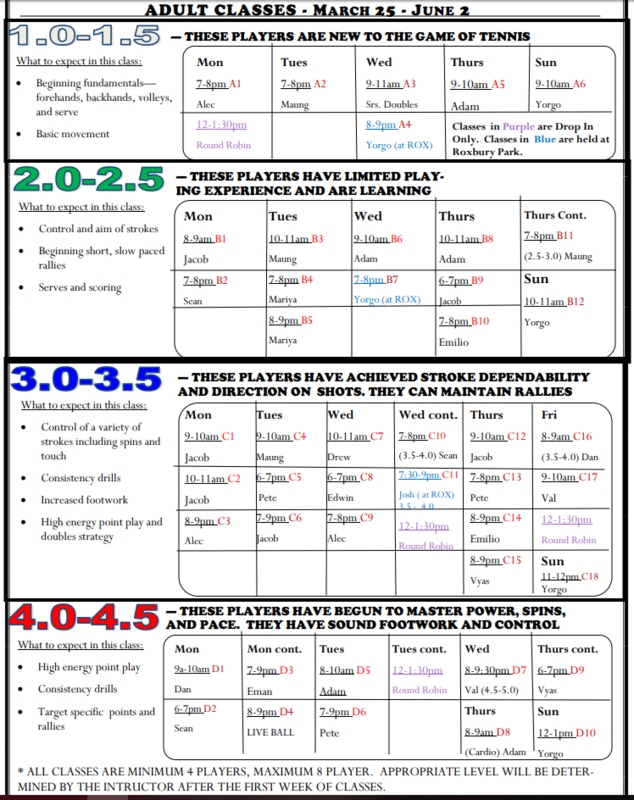 All players must be approve by Director Scott Crichlow. Try outs will be on Saturday March 16, 2019 at 2pm. Registration Under the Camps Section. The Spring Session of Classes will begin on March 25 and will run through June 2. It is a 10 week session. Spring Schedule is down below! Classes are held at La Cienega Tennis Center unless noted otherwise. Classes listed in purple are Drop Ins. All those registered in Group Classes will receive a store credit for any missed classes due to rain. There are no makeup classes. 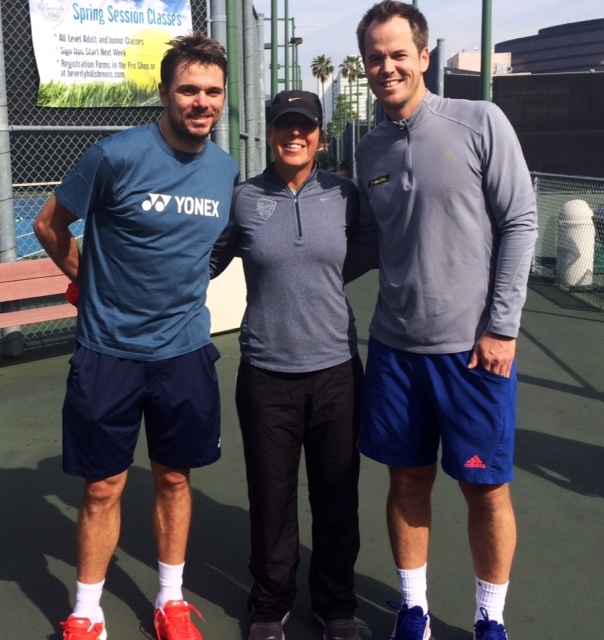 All Beverly Hills Tennis coaches can teach private lessons. 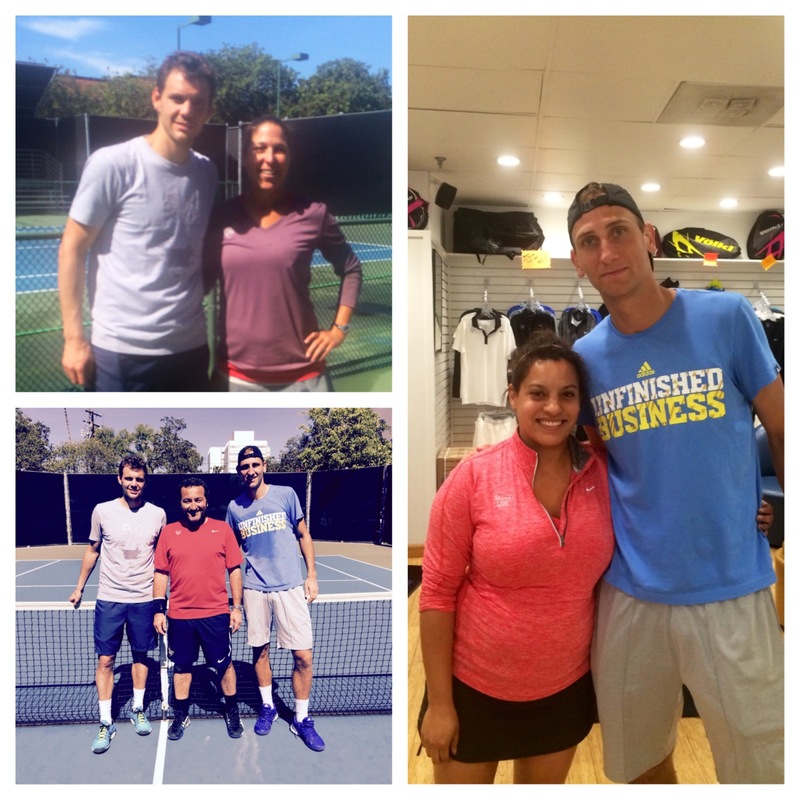 Only Beverly Hills Tennis coaches can teach at La Cienega Tennis Center, Roxbury Park, and Beverly Hills High School. You can read about our pros, and find their contact information in our "Tennis Pros" section. 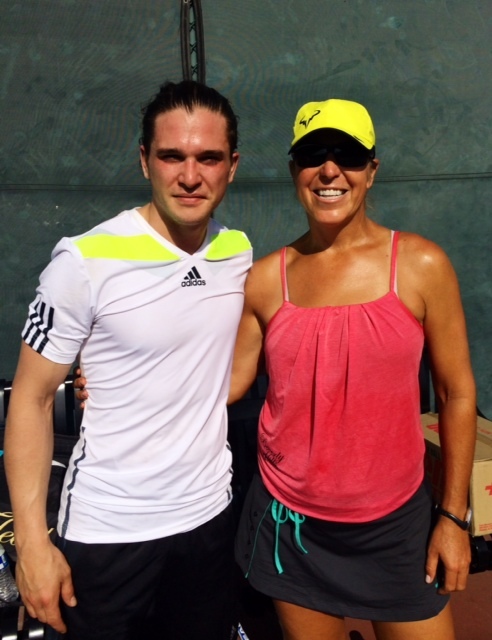 GM Hally Cohen with Game of Thrones star Kit Harington "Jon Snow"
World #3 and 2014 Australian Open champ Stanislaus Wawrinka and coach Magnus Norman stopped by Beverly Hills Tennis to get some practice in before Indian Wells. General Manager gave them some tips. Beverly Hills Tennis is located at La Cienega Tennis Center in Beverly Hills, California. Beverly Hills Tennis has been the concessionaire at La Cienega Tennis Center since 1995. La Cienega Tennis Center has 16 courts, 4 of which Beverly Hills Tennis has for Private Lesson use from 7am to 10pm. Beverly Hills Tennis also holds the concession for teaching tennis at Roxbury Park and at Beverly Hills High School. Beverly Hills Tennis offers a full service Pro Shop at La Cienega Tennis Center. The tennis facility also includes locker rooms with showers and a secured covered parking. Beverly Hills Tennis is open to the public giving you the private Country Club feel with no membership required. La Cienega Tennis Center and Beverly Hills Tennis was named one of the nations most Outstanding Public Tennis Facilities by United States Tennis Associations (USTA). 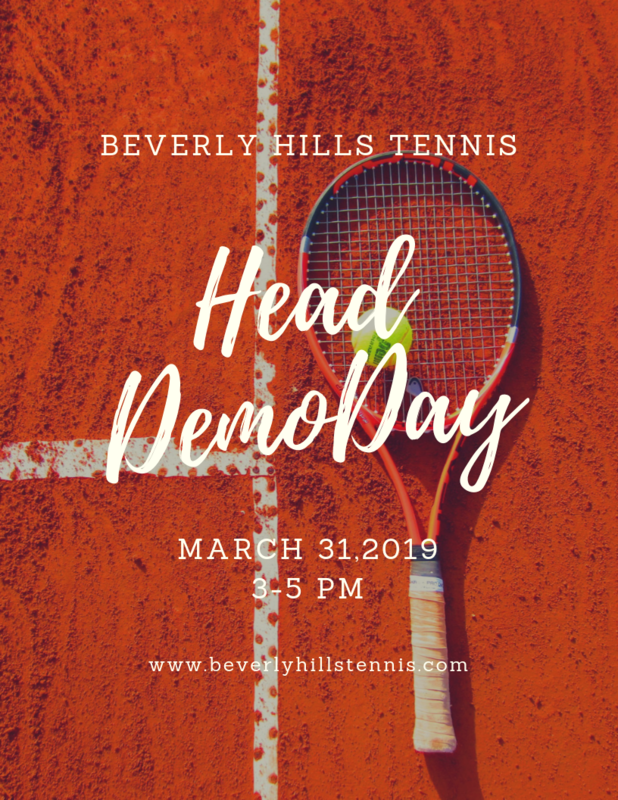 The wide range of services offered at Beverly Hills Tennis, include Private and semi-private lessons, 75 different Junior and Adults Classes, Adult Singles Leagues, Adult and Jr. Camps, and USTA sanctioned Tournaments. Contact one of our USPTA Certified Tennis-Teaching Professionals for instruction on the finer points of mastering the game of tennis. 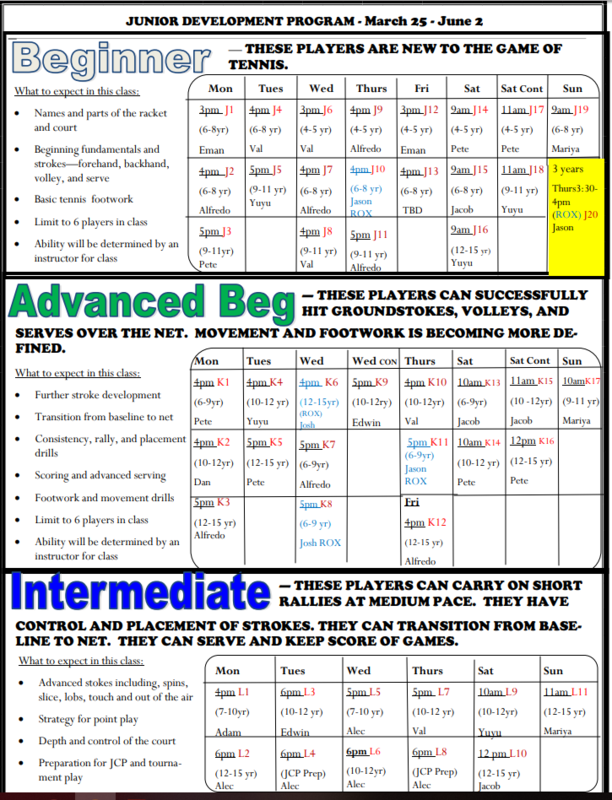 We have created a totally unique tennis environment that can be enjoyed by everyone at all levels. 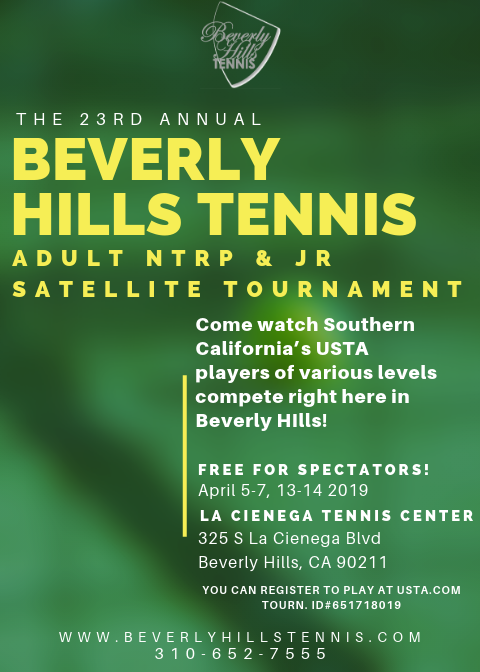 Follow the links under the Programs link for more information on all that Beverly Hills Tennis has to offer. There is something for the whole family. General Manager is Hally Cohen.